Info and some images by John Arnold Models, Inc. In the mid-1950s, General Motors, along with all the major car companies of the time, was enthralled with promotion. Coming off a decade of world war, the company was letting out all the stops to drive people to showrooms with glitzy ads, colorful promotions and incentives meant to get dealers nationwide excited to put one more GM product on the road. Nothing represented the promotion mania better than Chevrolet’s Corvette! Introduced in 1953, the Corvette featured styling cues no one had ever experienced from a US automotive manufacturer. 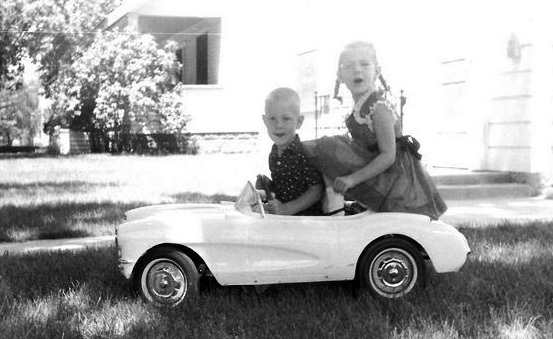 The Corvette was born for promotion and GM wanted every ounce of promotion capital from its little plastic sports car. But promotion wasn’t just for the adult car jockey who was itching to glide down the boulevard in a low slung roadster. The kiddies were part of the action too. UPDATE, 9/30/13: Since writing this article about the Kiddie Corvette, we’ve been contacted by John Arnold, John’s company, John Arnold Models, Inc. does full restorations and offers replacements parts for the Kiddie Corvettes. They’re are also widely considered the foremost authority on the rare pedal cars and are currently working on a complete history for a major publication. Info about that publication will be shared here when available. Their website is under construction, but for collectors to get in touch, email at moc.sledomdlonranhojnull@ofni. Or, check out their current E-bay auction here: http://www.ebay.com/itm/271228923739. And of course, the Lambrecht Chevrolet auction coming up in Pierce, Nebraska has uncovered another unusual find, another promotional item few got the opportunity to see and something Corvette enthusiasts are falling over themselves trying to obtain. You’d never guess that a Chevy dealer located in a tiny Nebraska town would be one of the higher volume dealers in the Chevrolet network, but Lambrecht Chevrolet was constantly being recognized for sales excellence. 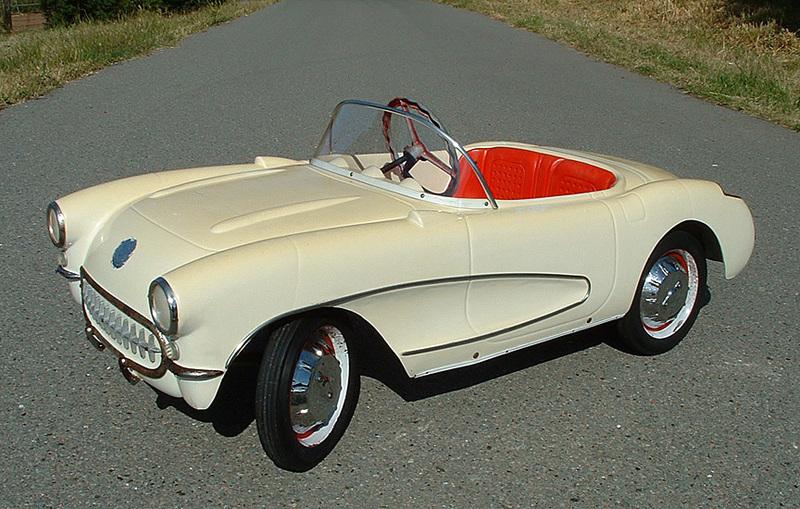 In 1956, Lambrecht Chevrolet received an award that would make any kiddie jump for joy… an exact replica 1/3 sized Corvette in the form of a pedal car. The hand built pedal cars could seat two little ones, had a shocking white exterior and bright red interior with red steering wheel and two speed rear axle, complete with floor shifter. The Lambrechts have pictures of their two youngsters, Jeannie and Mark, riding in the Corvette on their front lawn which was directly across the street from the dealer showroom. Here’s another low mileage Corvette at auction, but this one’s real! It’s doubtful Ray Lambrecht realized at the time that receiving this rare vehicle, which replaced the standard wall plaques and citations, would garner such huge interest over 60 years later, but interest is booming! Current Proxibid sales offersare topping $6000, no $7000 for the replica which shows typical kiddie wear and tear, but is complete and expected to bring in excess of $10,000 before the sale ends September 29. Accompanying the car will be a large print of the two Lambrecht youngsters pedaling the car in the yard, no doubt treating it as harshly as any toy might experience at the hands of youth. Eventually, the pedal car was outgrown, joining the collection of real vehicles Ray Lambrecht was stashing in and around Pierce. The pedal car was uncovered when Yvette VanDerBrink began the process of digging through not only the former dealership building but also the warehouses and outdoor field spaces where vehicles were placed during Lambrecht’s 50-year career as a Chevy dealer. The 52 inch pedal car is plastic, just like its namesake, and carefully detailed to replicate even the chrome side trim pieces, attached using sheet metal screws. It was built through a contract from GM to The Eska Company of Dubuque, Iowa, a forerunner to the eventual Ertl Toy Company which became so well known for its die cast replicas of all types of vehicles. Mounted on a steel tubular frame, the Corvette pedal car is shrouded in mystery because no one seems to know exactly how many were produced, though there are stories the plastic bodies were assembled by hand so quantities were probably limited. GM’s styling department was directly involved in its development and “downsizing” so the replicas appear to be dead ringers to the real thing, but a whole lot smaller. 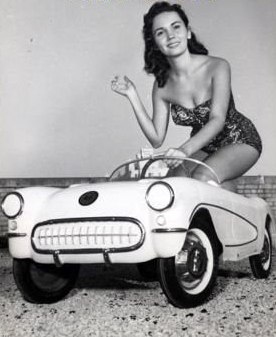 There are archive pictures of the mini-Corvettes being used at the 1956 Chevrolet Featurama where the newest innovations from Chevrolet were showcased for the buying public. The liitle cars were also photographed at a NASCAR Speed Week event in Daytona Beach where they were used in races and young participants had the opportunity to actually win a “Kiddie Corvette.” They also showed up on the Dinah Shore Show as part of a “See the USA in Your Chevrolet” contest. Whatever the origins, the Kiddie Corvette is another mystery emerging from the Lambrecht auction where bidders are coming from around the world to try and get just a piece of the past glory that Chevrolet was trying to create. So how high will the Kiddie Corvette go when the final gavel drop is made? I have one of these in Great Condition. Offers Considered. attn. pikesan; Have pics – don’t know how to get them to you. …. 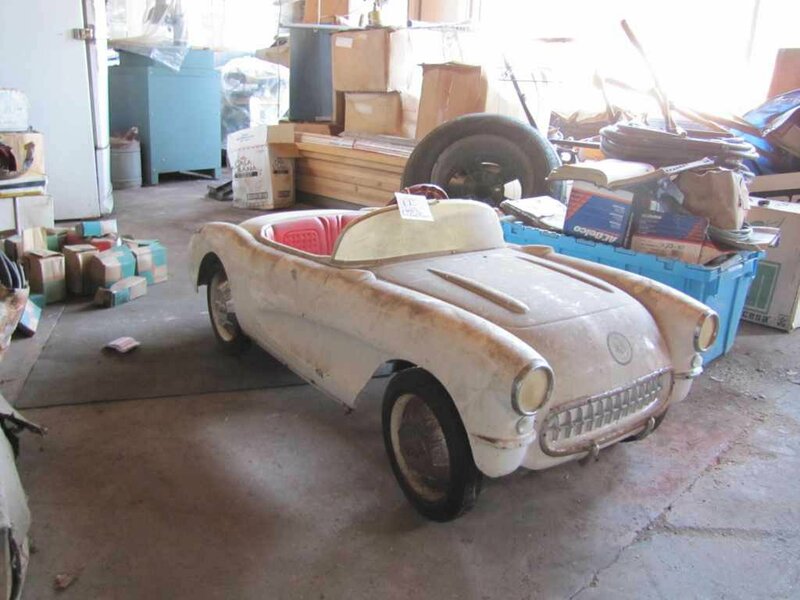 I will be listing a 1956 1957 corvette pedal car “Ballot Box” that was found in a dealership and never used….. on Ebay first week of April 2015 .